DIY - One Night Stand fundraiser! The One Night Stand Event was held in Pacific Grove, CA to benefit Animal Friends Rescue Project. 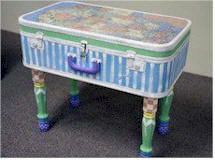 Over twenty-five very talented artists created whimsical and beautiful night stands to benefit AFRP animals! This fabulous fundraiser was held at a local boutique, where patrons bid on the chance to take home a one-of-a-kind night stand and support a good cause!